The 3 to 6 year-old child possesses what Maria Montessori called an “absorbent mind”. This type of mind has the unique and transitory ability to absorb all aspects (physical, emotional, and mental) of the environment, seemingly without much effort or fatigue. During this period, children are like little sponges, using all their senses to soak up information from their surroundings. This is the time where the intelligence is directed inwardly in an act of self-construction; and periods of development, where the intelligence is directed outwardly toward increasing knowledge, information, and experience in the world. During this period, children experience their environment mainly through touch. The experience becomes a part of them, it is “absorbed” by the mind – not memorized or learned. 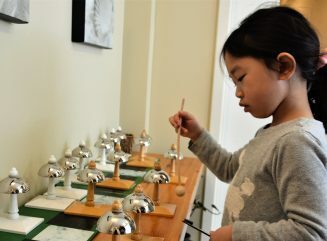 Our Montessori Casa program is specifically designed to nurture this extraordinary capacity of absorption and to meet the needs and interests of children between 2 ½ and 6 years-old. Our Casa classrooms are being conducted by AMI Montessori-trained teachers with special qualifications for the Casa level, and teacher’s assistants help with classroom management. 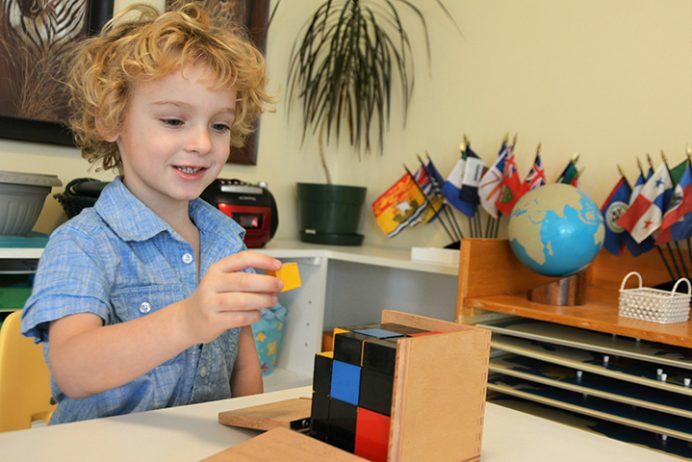 The Montessori teacher acts as a link between the children and their surroundings. The teacher guides each child to purposeful activities, based on his/her stage of development and learning style. With repetition and exploration of activities, children acquire concepts and skills, while strengthening concentration, joy for learning, motivation and self-discipline. The Casa Montessori environment is prepared for the multi-age grouping of children with learning materials appropriate for each age. The younger children observe and are assisted by their older classmates when needed. On the other hand, the older students have the opportunity to guide their younger classmates and feel proud of their contribution to the classroom community while reinforcing their own learning. This provides a supportive, family-like, social grouping where learning can take place naturally. Within our Casa environments, you see children pursing their interests with a variety of purposeful materials, a great deal of movement, and an incentive for concentration – all in an orderly space especially designed to meet the children’s needs. At a glance, you may see a three-year-old child washing clothes, a four-year-old is composing words with a moveable alphabet, a five-year-old solving an addition problem, and a small group working with geometric solids. In an atmosphere of non-competition, the child’s independence, self-motivation, and satisfaction increase dramatically from engaging in such activities. At Parkdale Montessori School, Casa children are exposed to English in the mornings and French in the afternoons, which is particularly important in the National Capital area. Each day (weather permitting), the children spend time outside in our equipped playground or in our large neighbourhood park. Each term, children go on an outing. Typical field trips include The Canadian Museum Of Nature, The Canada Aviation and Space Museum, The Central Experimental Farm, The Canada Science and Technology Museum, Valleyview Little Animal Farm, etc. Each day, the children are given time and opportunity to engage either individually or in small groups in various activities. The children are presented an array of materials, and they are introduced to all aspects of the world to cultivate their own natural desire to learn. These activities include tasks that children see as part of the daily routine in their home, such as preparing snack, sweeping, arranging flowers, washing windows, etc. To each child, these are meaningful activities that involve caring for themselves, others and the environment. Through those activities, children develop fine and gross motor movement, muscular coordination, hand-eye coordination, concentration, and they learn to complete a task from beginning to end. Children learn about the world around them through the use of all of their senses, which then educate the intellect. The purposes of the sensorial exercises are to enable children to manipulate, differentiate, order and classify impressions by touching, listening, seeing, tasting, and smelling. These materials also help children to form mental images of concrete objects, paving the way to abstract thinking. The environment provides rich spoken language, through conversations, stories and poetry. The use of specific materials helps children to link sounds and letter symbols. As the children are aware of the phonetic sounds, and can link them together, they progress on reading phonetic words. The children are then introduced to phonograms and sight words. Eventually they become fully literate. The language program also emphasizes on grammatical structure, function of words, cursive writing, and creative writing. 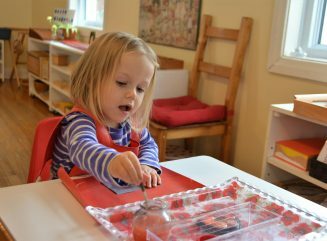 At Parkdale Montessori School, we take advantage of the children’s early years and their incredible capacity for absorption to introduce oral French. In order to respect the principles of the Montessori Method, we do not “teach” French during “formal lessons” or “circle time” at the Casa level. Instead, we introduce a second language in a very natural way into daily activities. Each afternoon, our teachers converse in French with each other and the children in an informal manner. Children are introduced to new French vocabulary around classroom activities and classified cards, as well as by way of stories, songs, and poetry. 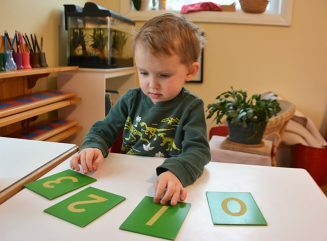 Children are introduced to sensorial impressions of numbers, decimal system and its function, addition, subtraction, multiplication and division. Children are first introduced to quantity, then symbols, followed by the association of both quantity and symbols. Once children understand the concept of numbers from 0 to 10 in a very fundamental way, manipulation comes easily. Addition and subtraction are introduced in logical, concrete way. Once these concepts are well understood, multiplication, and then division are introduced. Later, children explore and memorize addition, subtraction, multiplication, and division tables, using specific tools. Cultural materials are presented as extensions of the sensorial and language activities. These activities are used to broaden children’s experiences and draw their attention to various aspects of the world around them. The geography materials provide children with the opportunity to classify the world into continents, countries, provinces, states; each with their own particular shapes, names, capitals and flags. Geography activities also aid children developing a foundation of global awareness and a respect for all cultures. The science materials provide children with exposure to basic leaf shapes, parts of the leaves and the flowers, life cycles, animals and their parts, etc. The comprehensive art and music programs give children the opportunity to enjoy a variety of creative activities, as well as gain knowledge of the great masters. Children have access to a large and secure playground designed to encourage social interaction, exercise, and hands-on study of natural sciences. Children participate in taking care of the outdoor environment, by gardening, raking, pulling weeds, planting bulbs, etc. 8:30 to 11:30 Morning cycle and snack time. 11:30 to 12:30 Lunch and preparation for outside play. 12:30 to 1:30 Outdoor play time. 1:30 to 3:30 Afternoon cycle and snack time. For nappers: nap time and snack time. 3:30 Children gather their belongings to go home or to aftercare.